What is a Waterford Blaa, Anyway? The Waterford blaa has been granted protected status by the EU. But, what is a blaa? A bored fish, perhaps? A melancholy sheep, maybe? Nope. It’s one of the finest bread rolls known to humankind. We all know that real Champagne only comes from the Champagne region of France, but the fact that there’s a European body charged with certifying which products are synonymous with which places, and enacting legislation to ban anyone else making a product with the same name, is not something that most people care to worry about. Hence, other vineyards only make sparkling wine, not champagne. Ireland has been slow to get its unique products protected in this way*, but the humble Waterford Blaa is now one of Ireland’s unique food products. What is a blaa, I hear you ask? Well, it’s a type of soft bread roll or bap unique to Co. Waterford. 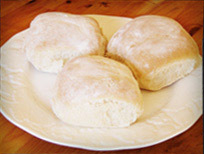 A blaa is about the size of a saucer, and finished with a dusting of flour. With a nice crusty top, it’s perfect for making a sandwich. The name is derived from either the French word blaad, for leftover dough, or blanc, for white (referring to the flour). The roll came with French Hugenot settlers in the late 1600s, and it is claimed that white flour may have been largely unknown in Ireland at this point. The blaa is baked without artificial ingredients, thus it doesn’t travel far — although hardy Waterford ex-pats have been known to have frozen blaas shipped overseas to satisfy their hunger. The term blaa has come to be a feature of Waterford life, serving as a slang term for money, as well as carrying numerous other meanings in different contexts. A blaa should be eaten fresh. Hot from the oven with a smear of butter is popular, as are blaas with rashers (slices of bacon much less fatty than American cuts, and served while the meat is still succulent and flavorful — i.e. not burned to a crisp), or another local delicacy “red lead.” Red lead is a spiced pork sausage (offal) patty with a pink or red color. A blaa with red lead was long the favored lunchtime meal of the employees of Waterford Crystal, who dubbed the patty red lead, presumably because of its similar color to the lead ingots used in making the crystal. If you’re familiar with black or white puddings, you’ll know what to expect. My favorite is a “hang blaa,” a blaa filled with cheese & onion crisps (that’s potato chips to Americans) and a slice or two of ham. Hungry yet? Well, you’ll have to get down to Waterford to try an authentic blaa, because that’s the only place they can be made. The best time to eat them is before attending a big match, and they should be washed down with a strong cup of tea. Enjoy! *Other Irish foods granted protected status by the EU are: Connemara Hill Lamb, Lough Neagh Eels, Clare Island Salmon, Timoleague Brown Pudding, and Imokilly Regato Cheese.